As part of the In Place exhibition held at Kedleston Hall was Memoria Corona. 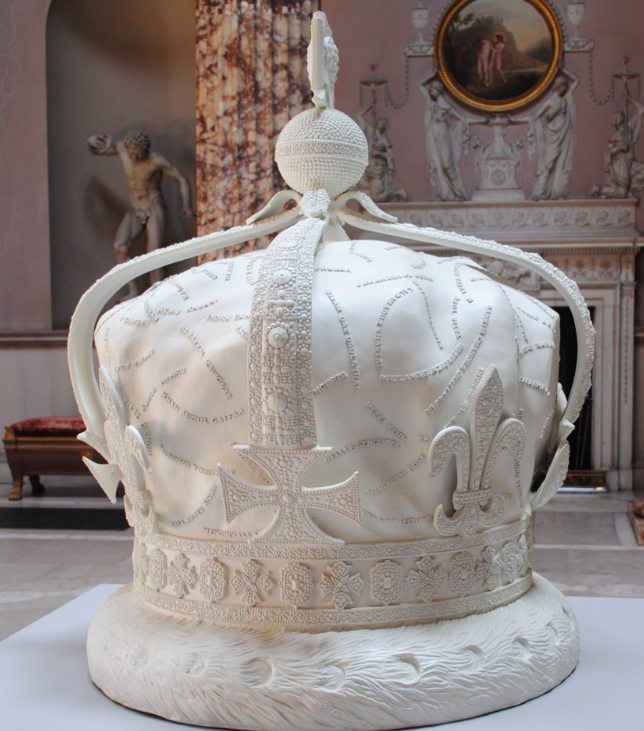 Occupying the centre of the magnificent Marble Hall, the crown resonated with the presence of the British Crown in India over the last two hundred years. Modelled on Elizabeth II’s crown, it is topped with a Kohinoor diamond which was lost by India to the British during the Raj. Made from Ivory duco paint on fibre reinforced plastic, Memoria Corona is the work of the Indian visual artist Reena Saini Kallat. As part of the Frank Cohen collection, the work is a memorial to the Indians who fell during the fight for independence and the surface is covered with their names. 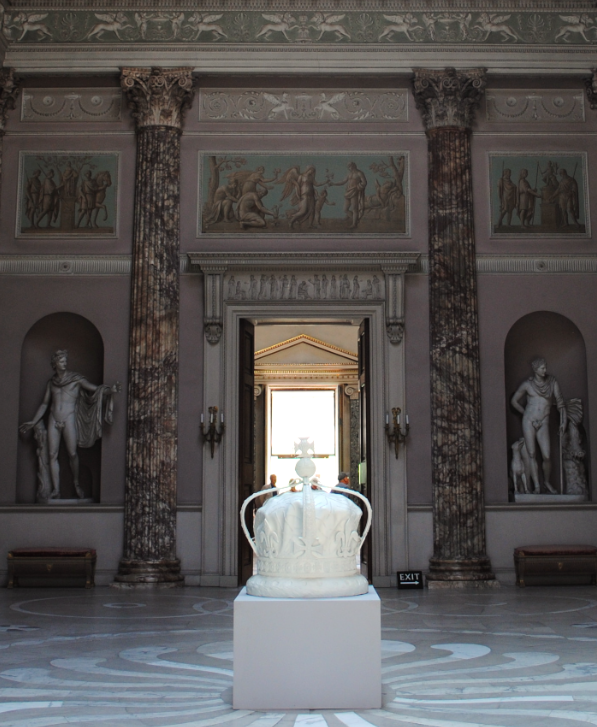 Kedleston Hall was one of four venues that was part of a contemporary art programme which sought to look at the ties between Britain and the Subcontinent. Hosting the Shakti exhibition at Kedleston Hall was an opportunity to focus on the cultural and artistic perspectives of the Indian collection which once adorned the wonderful architecture of Robert Adam. The Eastern Museum at Kedleston was built to house such objects and was designed by George Nathaniel, Marquess Curzon, who was Viceroy of India between 1899-1905. 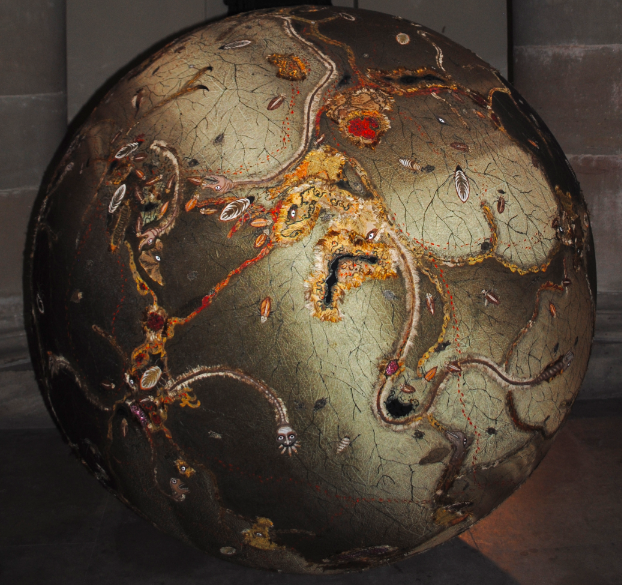 The Feral Sphere was exhibited as part of the collection acquired from India by Frank Cohen. The sphere is constructed from fibreglass, fabric and acrylic paint and is the work of the Indian sculptor and painter Jagannath Panda. 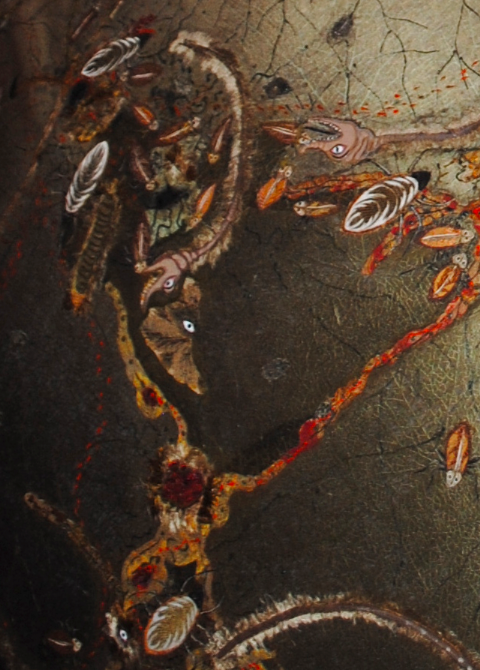 Featuring exquisite embroideries, the Feral Sphere reflects developments in contemporary art. Frank Cohen was the first person to present a major exhibition of contemporary art from India in the UK and he collects works which represent the rich culture based on respective history, folklore and craft. 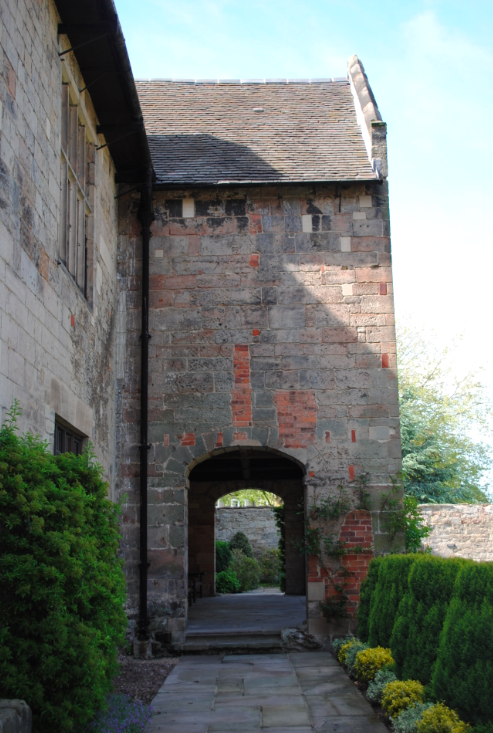 Located between Pears School and Repton School Library is the tranquil cloister Garth. Private and secluded, The Garth has a war memorial to the Schools fallen during conflict. 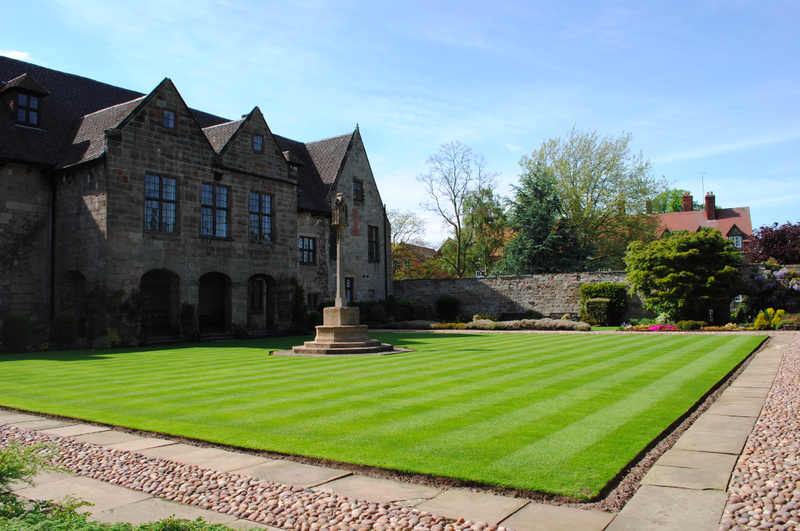 The Garth is at the heart of the school and was originally the cloistered garden for the Augustinian Monks who practised at Repton Abbey. 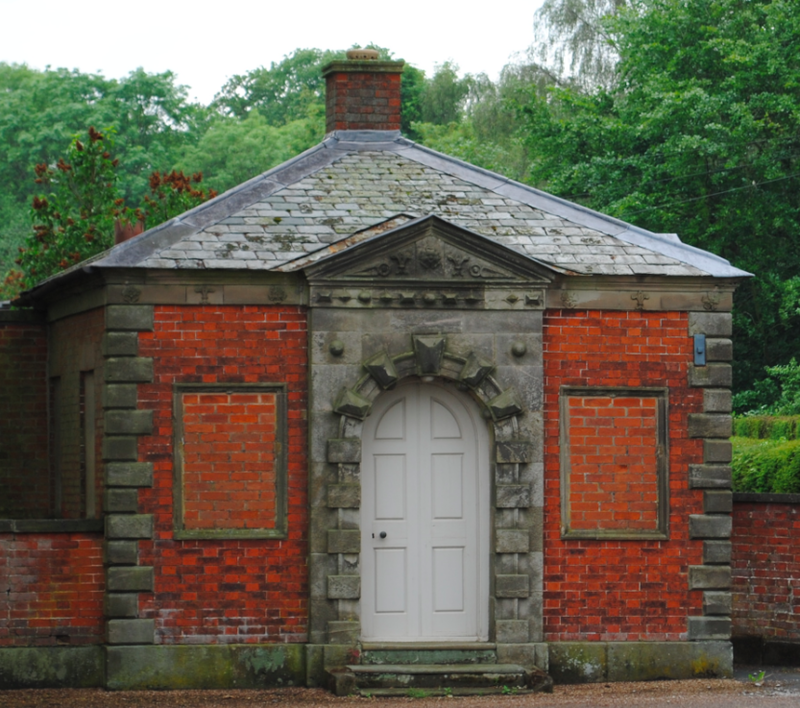 Located to the north of Sudbury Hall are two gate lodges. Dating to 1787, the lodges are believed to be the work of the English architect Thomas Gardner of Uttoxeter. Constructed of red brick with ashlar dressings, the lodges feature a central projecting pedimented bay with rusticated arched entrance. The almost identical pair of lodges are Grade II Listed. 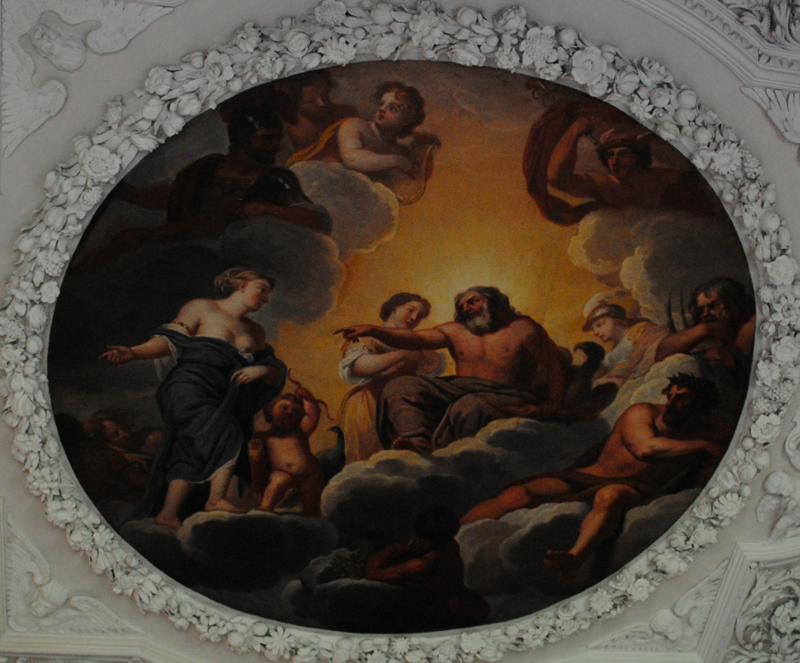 On the ceiling above the Great Staircase at Sudbury Hall is the above painting of Venus petitioning Jupiter. The oil on canvas painting depicts a scene from Virgil’s epic poem the Aeneid. 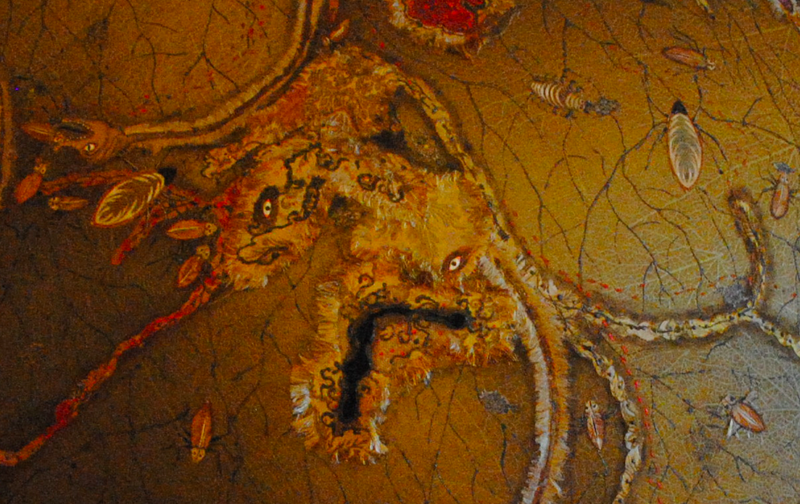 The painting is the work of the French artist Louis Laguerre and dates to the 18th century. 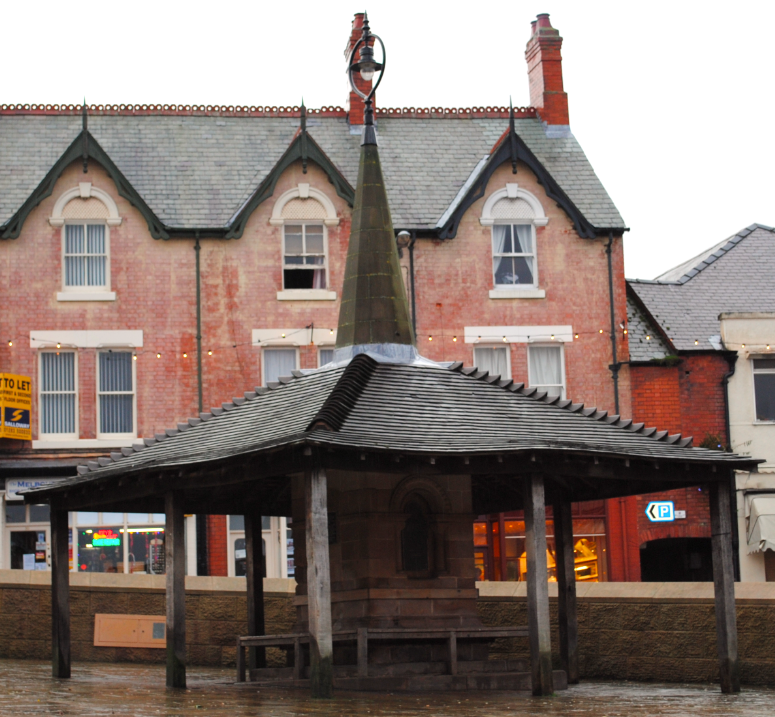 In the Market Place of Melbourne is the Market Cross by James Wright. Dating to 1889 with alterations in 1953, the cross was constructed from ashlar and timber. Restored in 1977, the large central stone pier has a wooden bench attached. Within a niche on the west side, there is an inscription which states “Erected in 1889” and on the north side, a brass plaque records that the monument was erected to celebrate Queen Victoria’s Jubilee. The timber shelter was erected in 1953 and the monument is Grade II listed. 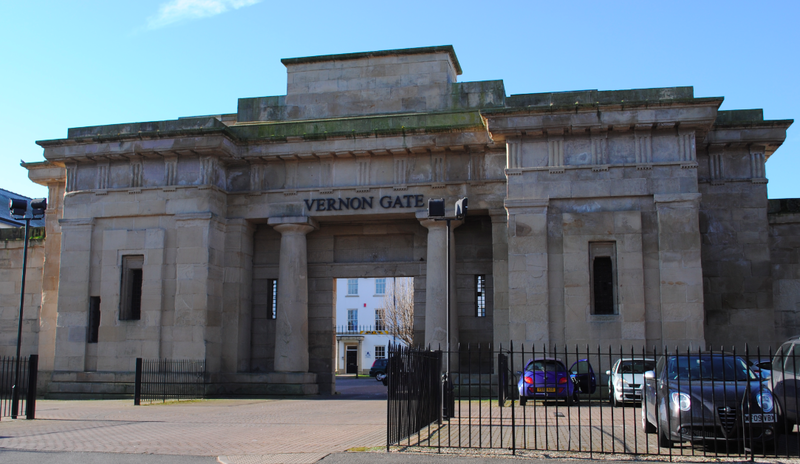 Also known as Vernon Street Prison, the New County Gaol served as the county Gaol from 1843 to 1919 when it was demolished. All that remains today is the impressive facade (above). 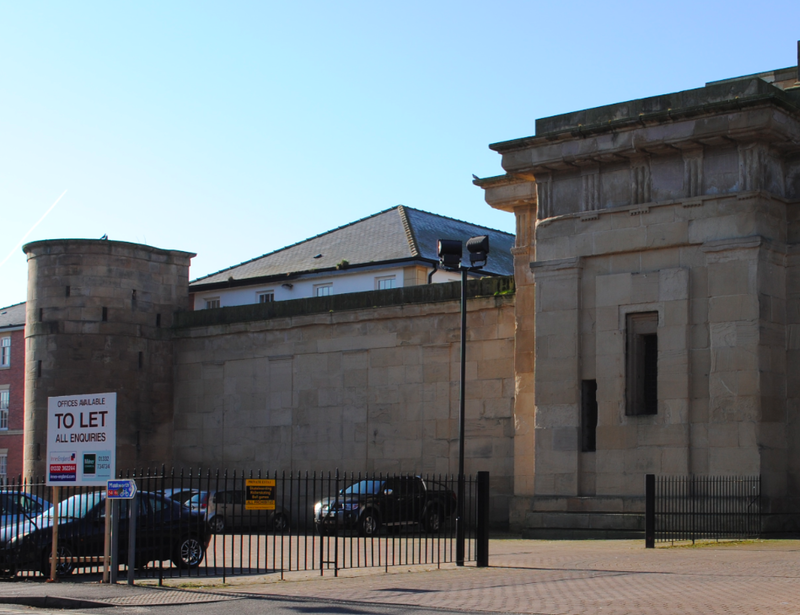 Designed by the English architect Francis Goodwin, the Gaol initially had 185 cells. 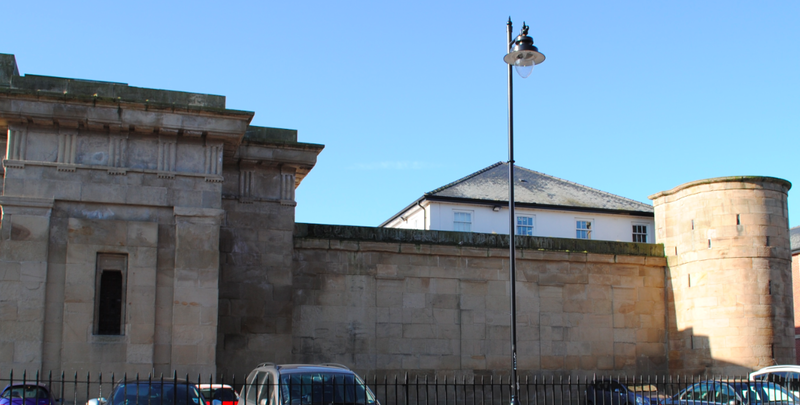 Designed in a wheel layout, the central hub of the Gaol was formed by the chapel and governor’s house with seven cell wings. The huge gates and 25ft high walls were constructed from freestone ashlar with the central entrance flanked by two tuscan columns supporting the triglyph frieze above. The Gaol has Martello towers and the surviving facade is Grade II Listed.